Create a Load Balancer and Auto Scaling Group. Bootstrap an EC2 instance to download the code from S3 and deploy it. This is useful for developers to get their applications quickly deployed on AWS. With Elastic Beanstalk, you don’t need to understand how any of the underlying infrastructures work. Cloud Formation is much more powerful than Elastic Beanstalk because you can actually design and script custom resources beyond what is listed above. This is a very simple template. But CloudFormation can do a whole lot more. Right now, CloudFormation can interact with the following services. Create a DynamoDB table with global and local secondary indexes. Create an AWS OpsWorks stack with a load-balanced application that runs inside a designated VPC. Create an Amazon RDS database instance with provisioned IOPs. Create a publicly accessible Amazon S3 bucket that is configured for website access. Create a VPC and add an Amazon EC2 instance with an Elastic IP address and a security group. As you can see, AWS CloudFormation is much, much more powerful than AWS Elastic Beanstalk whose features make it especially useful for Solutions Architects rather than developers. 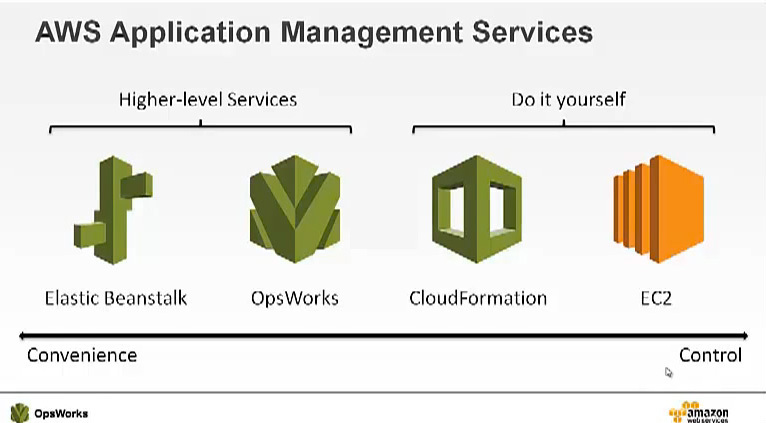 AWS OpsWorks provides a simple and flexible way to create and manage stacks and applications. With OpsWorks, you can provision AWS resources, manage their configuration, deploy applications to those resources, and monitor their health. OpsWorks uses Chef cookbooks to handle tasks such as installing and configuring packages and deploying apps, and includes a set of built-in cookbooks that support the built-in layers. If you are already familiar with Chef, then you will know that there is a large base of community-created recipes to pull, covering most common configuration tasks. Note that, just like Elastic Beanstalk, AWS OpsWorks can be controlled using AWS CloudFormation templates. Sometimes a picture is worth a 1000 words. Here’s what you will see from the AWS OpsWorks management console. There’s obviously a lot more to OpsWorks, and I hope to offer a more in-depth analysis of OpsWorks in future posts. In the meantime, be aware that Cloud Academy recently released a hands-on Lab to guide you through an actual OpsWorks deployment.